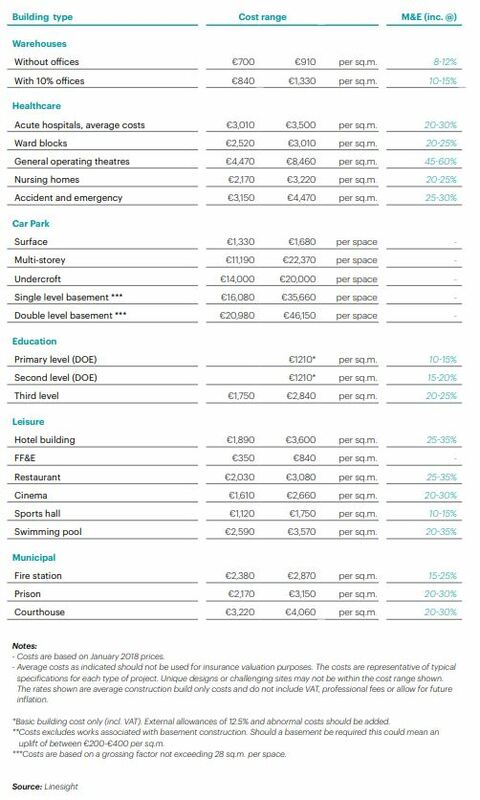 Every year we share useful information to guide you on the costs for your construction project in Ireland. 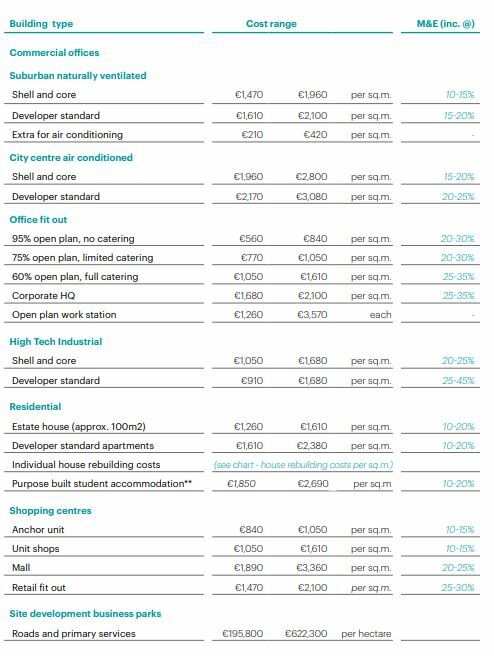 This will help you to estimate an approximate figure for your building costs. You can check our other articles in this series here. Tender prices are still increasing in 2018, with construction inflation levels running well ahead of general inflation. This is fuelled by increasing demand, skills shortages, pressure on wage rates, increases in material prices and regulatory changes. Linesight’s research shows that, on average, tender prices rose by approximately 7.5% during 2017 while construction input costs rose on average by 3%. Due to high ongoing demand this level of increase is likely to continue for the foreseeable future. During 2018 Linesight predicts that tender prices will increase by 7% on average. The increase in tender prices, which we expect to continue, emphasises the importance of budgeting for future construction inflation in feasibility studies and cost plans. 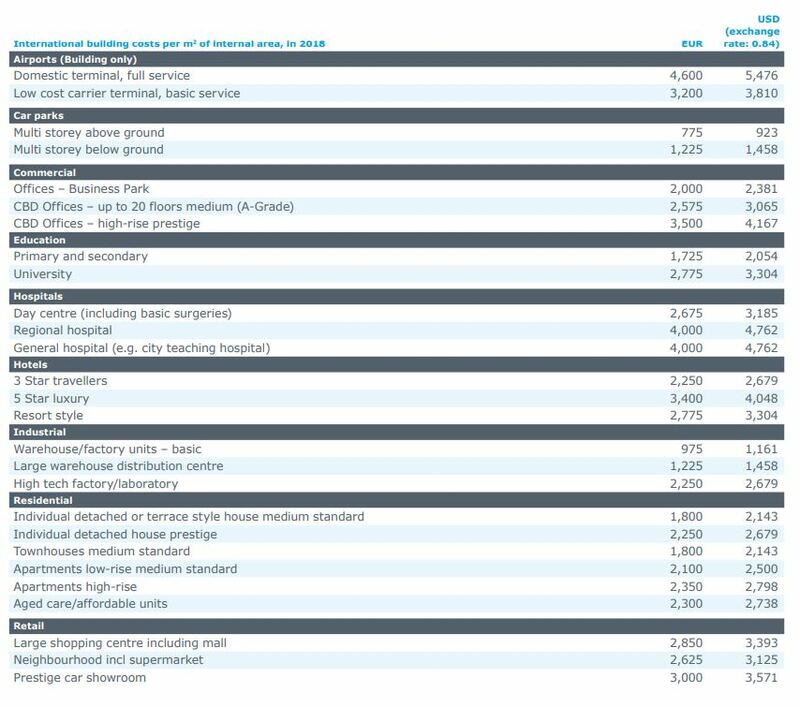 The average construction costs table is generated using Linesight’s Cost Database and sets out typical building construction costs. 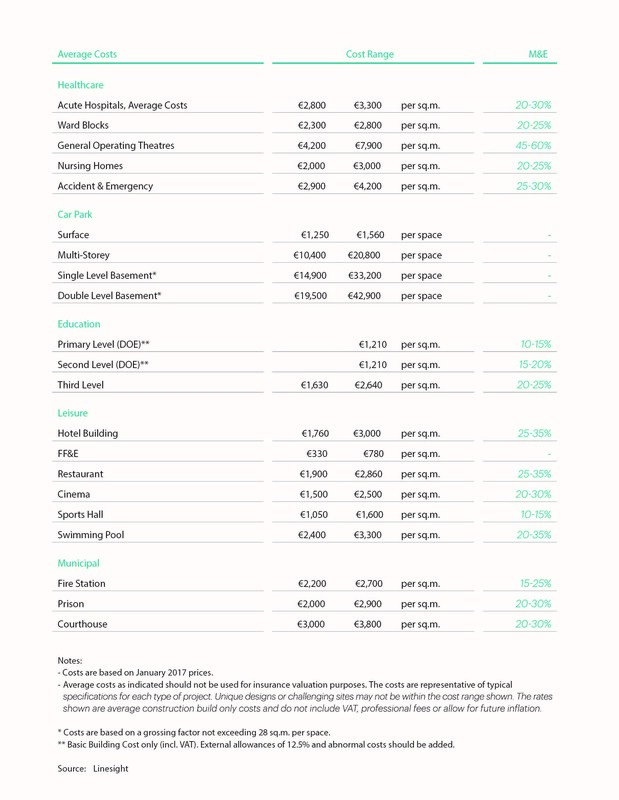 Turner & Townsend‘s annual construction cost survey also provides an overview of construction costs in Ireland. 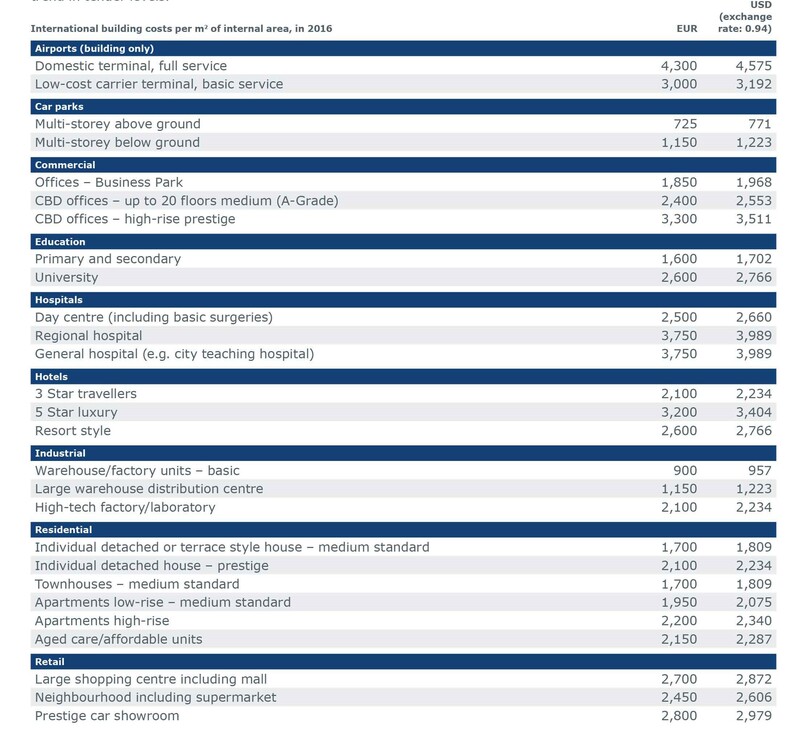 Turner & Townsend‘s annual construction cost survey provides labour costs and also the prices for some materials. Their cost escalation forecast for 2018-2019 is 7%. The most notable yearly changes were increases in Bituminous emulsions (+10.2%), Plaster (+6.9%) and Paints, oils and varnishes (+7.5%) while there were decreases in Sand and gravel (-17.9%), ready mixed mortar and concrete (-1.9%) and Concrete blocks and bricks (-1.5%). Selfbuild magazine has partnered up with ProntoCalc to provide the FREE Selfbuild Build Cost Calculator. You can try it here. There are a number of other expenses that you should also consider when estimating your project. See some of the exclusions that may apply to your project here. Timber is classified as a renewable material, as the principle holds that if a tree is felled another is planted in its place. As long as this balance is maintained, the supply will be sustainable. A prefabricated timber frame can be erected on site faster than a comparable brick and block construction. However, timber frames may require additional time for their design and fabrication, which can lead to a longer wait before work begins on site. The quicker erection time enables interior trades such as plastering and electrical wiring to begin work earlier in the build programme, as the interior will be exposed to weather for less time. Off site fabrication can allow higher quality to be achieved. The fire resistance of timber frame buildings is achieved by a combination of the lining material, the timber structure and the insulation. 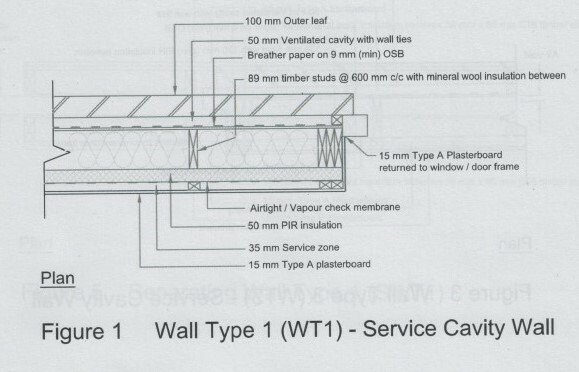 Recent fire tests commissioned by the Timber Frame Industry and the ITFMA showed that in general a 15mm Type A plasterboard is required to meet the Fire resistance of REI 30 for external walls (see detail). 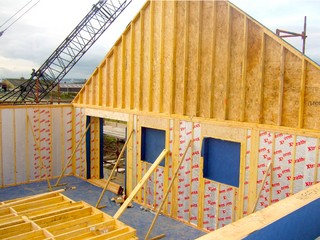 Timber frame structures must include a vapour barrier between the lining of the inner wall and the insulation, to prevent vapour passing through. Timber frame structures may not achieve the same level of sound insulation as concrete or masonry as they are not as dense. The Irish economy will continue to recover and the upturn in the construction industry is well visible. A shortage of skilled labour has lead to an upward trend in tender levels. Linesight’s research shows that, on average, tender prices rose by approximately 7% during 2016. Linesight predicts that tender prices will increase at a faster pace of 7.5% on average, due to the shortage of resources. Greater increases are expected in the Dublin area and this could be 9% or even higher for complex city centre projects. SCSI reports that if price inflation continues to grow at the current level, it is anticipated that pricing levels will return to the levels last seen in 2006 and 2007 in the next few years. 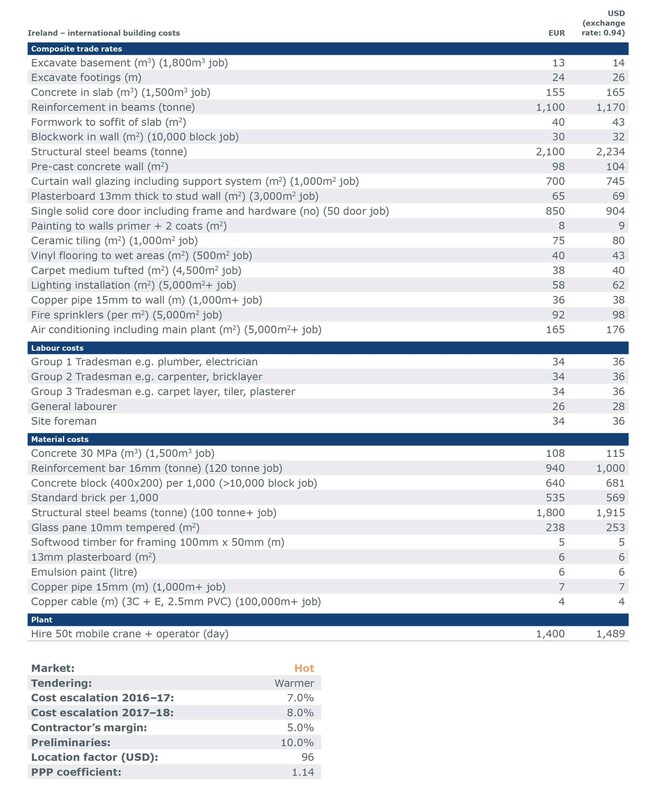 Turner & Townsend‘s annual construction cost survey provides labour costs and also the prices for some materials. Their cost escalation forecast for 2017-2018 is 8%. The latest monthly data from CSO recorded that all materials prices increased by 3.4% in the year since July 2016. The most notable yearly changes were increases in Glass (+21.7%), Sand and gravel (+21.4%) and Plaster (+7.9%) while there were decreases in Other concrete products excluding precast concrete (-1.5%), Concrete blocks and bricks (-0.6%) and Other structural steel (-0.4%). 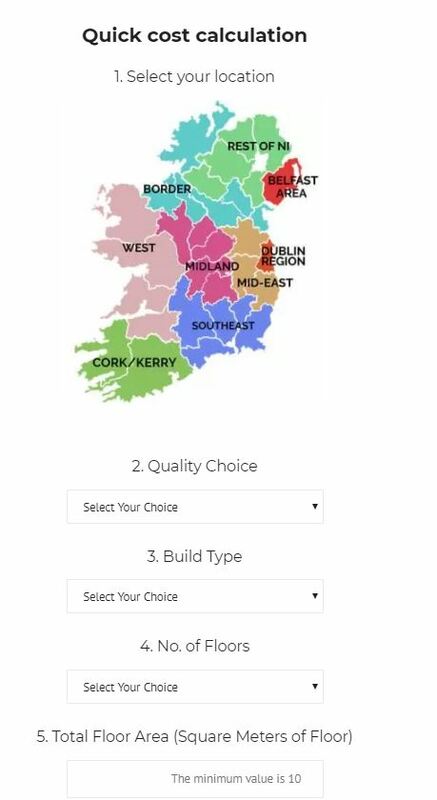 The Society of Chartered Surveyors Ireland (SCSI) provides a House Rebuilding Cost Calculator here. 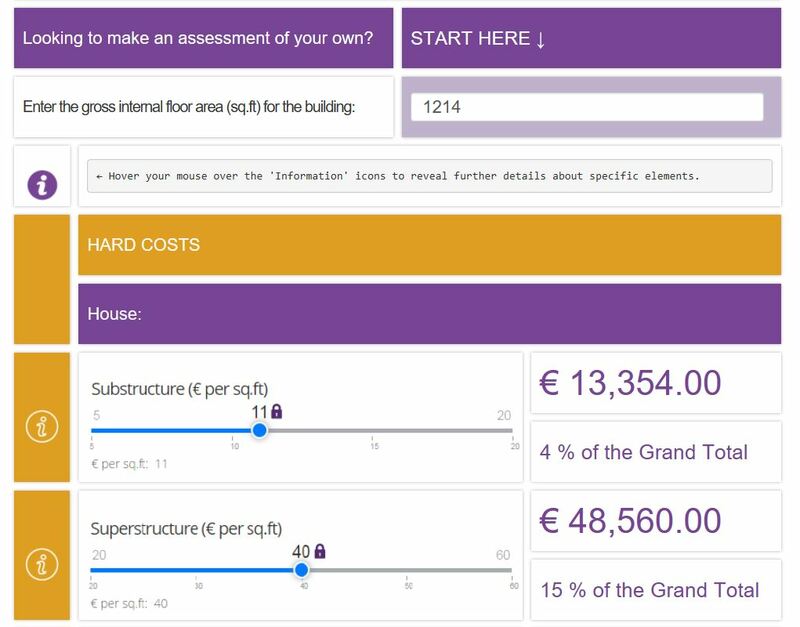 This calculator can be used as a guide to give you a minimum base cost for your construction project. 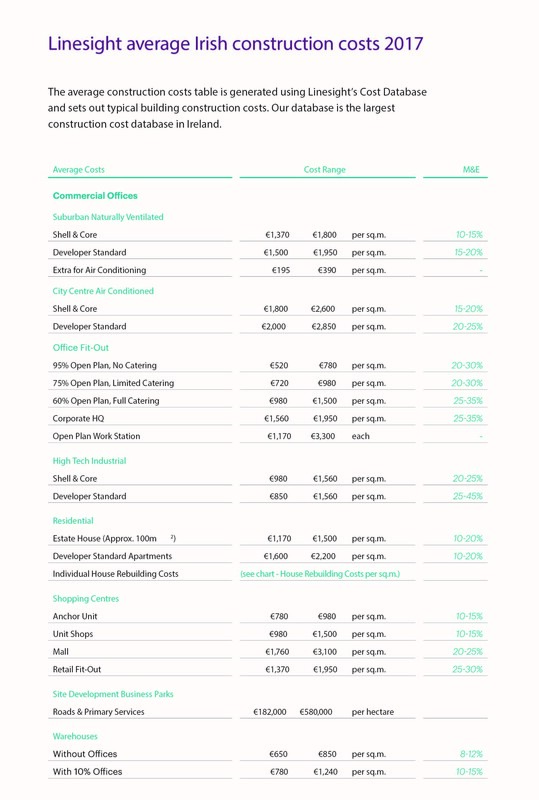 SCSI have developed a useful online calculator for developers to perform an analysis tailored to their own developments. Private/individual users should use this calculator cautiously. Professional fees, for example, will be considerable higher for private developments than they are for developer built schemes where the level of repetition is often high. 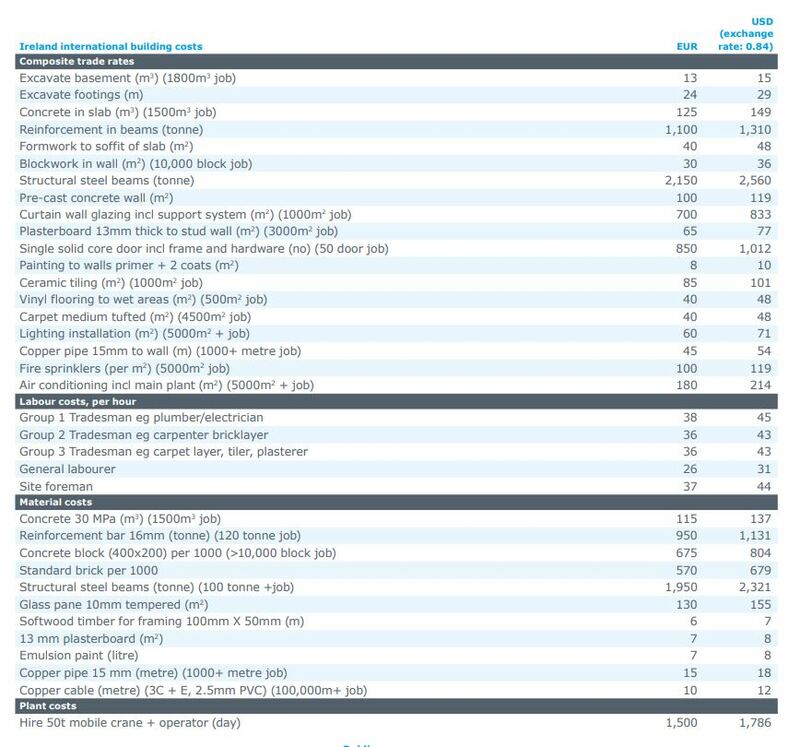 SCSI highlights that the actual construction costs or hard costs made up less than half of the total costs. The online calculator allows users to adjust each elemental component of both the hard and soft costs for themselves.